I love my Ubuntu t-shirt. 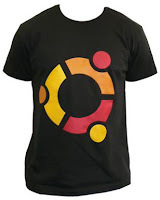 I especially like it because it just has the logo, not the name Ubuntu, which is a trademark of the computer company Canonical. I figure that those who recognize my t-shirt will be able to trade smiles with me, knowing as I do what special people we are. This specialness is the exact opposite of the real meaning of the Zulu and Khosa loanword ubuntu, "humanity," "humaneness," or "human solidarity." My use of Canonical's Ubuntu® logo as an exclusive identity marker is a flat-out contradiction. In my own defense, I can only plead playful intent. (And in Canonical's defense, they explicitly link their Ubuntu open-source operating system, rooted in global community collaboration, with the southern African philosophy of that name, and with its values.) Which does the world need more of, in these times -- cool logos or human solidarity? What got me thinking about the uses and pitfalls of identity was David Rupert's article, "How Jesus Dealt with Identity Politics." He begins by summarizing all the ways politicians pander to social subgroups, and how those subgroups are tempted to emphasize their specialness and trade on their grievances. Rupert doesn't build a perfect case, and some of the comments posted by readers cite his overly broad strokes. But I mostly agree with his important overall assertion, "Our identity is in Christ." Touching on Jesus's constant crossing of social boundaries, and Paul's revolutionary manifesto of unity ("There is neither Jew nor Gentile, neither slave nor free, nor is there male and female, for you are all one in Christ Jesus," Galatians 3:28; context), Rupert sums up: our identity in Christ is all the identity we need. Ultimately, I think he's right. Now I know that in the evangelical subculture, to quote Scripture and subordinate everything to Jesus is how you guarantee being right. That behavior is an identity marker! But he's right because Jesus really does reset all distinctions and hierarchies and specialness of all kinds, in favor of the central and precious truth: all of us are created in the image and likeness of God, and (to borrow from Anthony Bloom) were born of God's wish to have our company. First, we were all born in history, in specific times and places, and in specific families. Those circumstances played a part in forming us. As we grew older, we matured in our relationship with our own origins, and deliberately made changes -- some trivial, and some very substantial. Most of my schoolmates were Chicago Cubs fans, but I held out stubbornly for the White Sox. More importantly, I grew up in an atheist family and became a Christian. I resisted my mother's identification with Germany's militaristic past and became a Quaker ... and was disinherited. There are pleasures and pains connected with all of these details and these choices. It's completely normal to delight in the places and people we feel closest to. With that delight, with that pride, comes an obligation: to think seriously about whether we let those identifications separate us from others who don't share them. It is that obligation that the church can help us fulfill. When my church loves me for all my inherited and adopted peculiarities (or despite them! ), it is then in a good position to show that, through my identity in God, I can delight in others' peculiarities and in the promise that we are all actually in the same blessed family. Jesus, too, was born in history, in a specific time and place. Being Jewish, he grew up in a people who (our family album, the Bible, tells us) were charged by God to be a channel of blessing to the whole world. By becoming part of the Body of Christ, we now share that charge. There's another reason we can't neglect identity. We did not grow up in separate silos of identity; our families and communities, ethnic groups and nations, all impacted each other ... and not always for the better. If you grew up in a family whose options were limited by the violence of racial or class oppression or any other systemic evil, and if I grew up in a family that was, at best, oblivious to all that, I do not have the right to tell you to set aside your "identity politics" for the sake of avoiding discomfort on my side. I don't have the right to set abstract piety above the requirements of justice and reconciliation. The very moment we're together in the body of Christ, our love for each other cannot be buffered by denying our very different paths to this one place. Outside the church, identity politics can degenerate into sad spectacles of people and groups one-upping each other based on conflicting claims of virtue or victimhood. Inside the church, things should be different. We can offer another way: to maintain a diligent, persistent curiosity about each other's varied identities, and the joys and laments that we sang by the rivers of Babylon. There's no contradiction between that honest, loving, sometimes awkward inquiry, and our joy at having found each other in this new place, in Christ. Good News and identity politics, part one. part two. Patricia Dallman on Lewis Benson, George Fox, and Christian universalism. Preparing for World Quaker Day. Micah Bales: The Sabbath of God is within you. John Jeremiah Edminster: The meetinghouse library you might not have known about.